Sometimes it’s the little extras that simplify life and free-up more fun time. 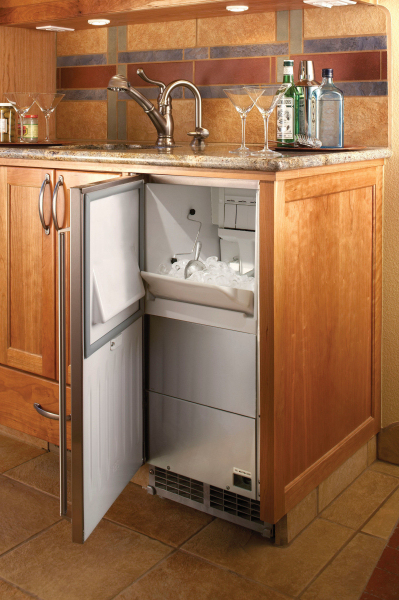 Sounds crazy, but adding convenient storage features to existing cabinets—pull-out shelves, drawer organizers and appliance lifts—saves time, maximizes storage, and saves your knees. 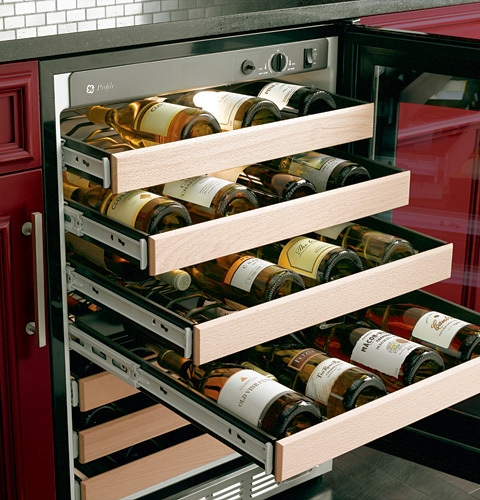 No more diggin’ through a bottom cabinet. 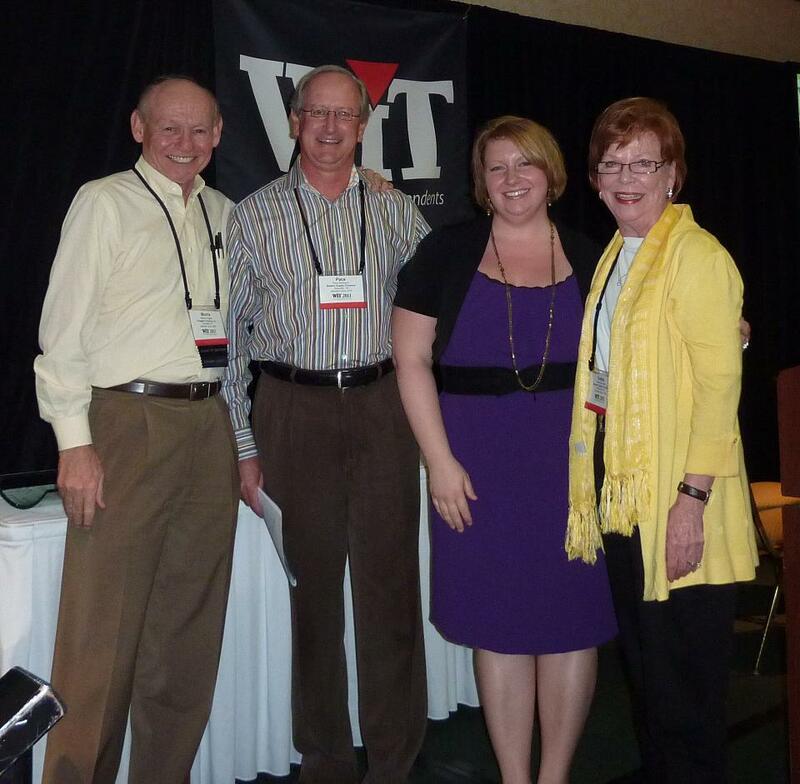 Here a few of my favs! 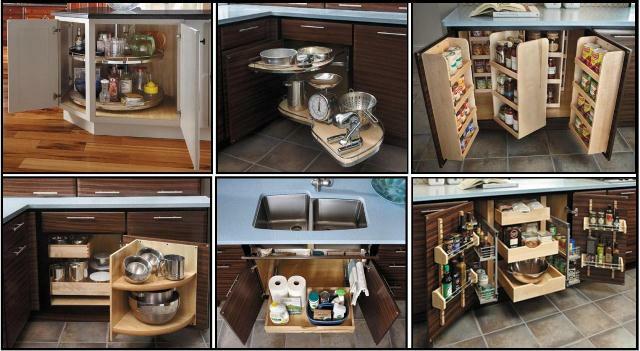 Blind corner cabinets are the worst organized in the kitchen. 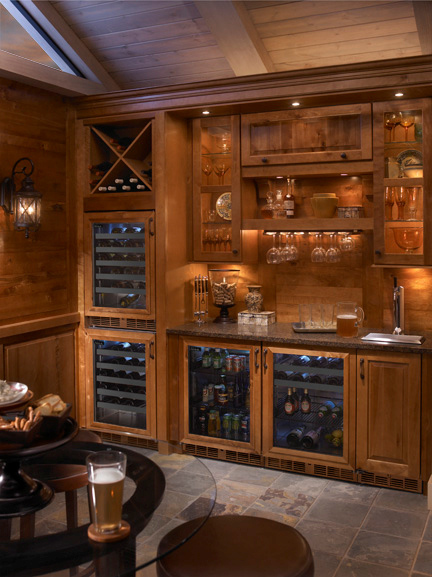 You know, they’re the cave-like cabinet where you store the juicer you never use. 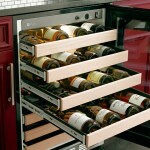 Now, there’s a variety of swing-out shelving units made just for blind cabinets. Useful space…how smart is that? StarMark’s towel storage can be designed into your new cabinets with in as little of 3″ of space! 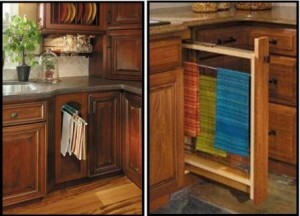 Where do you hang your damp kitchen towels? Oh no, don’t say over the stove or dishwasher handle! 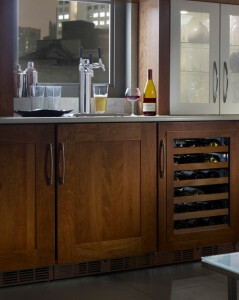 A pull-out towel hanger mounted in a base cabinet is easy to install and looks sooo much more upscale! 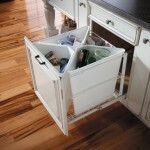 Make recycling handy with a base cabinet slide-out that holds one to four bins. There’s also really cool germ resistant microfiber pull-out bag with handles—just lift and you’re off to the recycling center. Ironing board folds up neatly in a drawer. 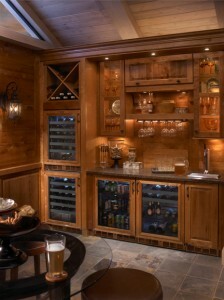 Photo from Armstrong Cabinets. 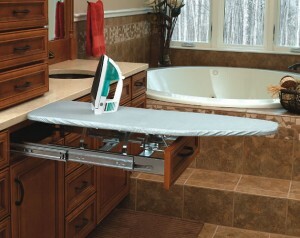 For those of us that are anti-wrinkle ironing freaks, a wall mounted ironing board is the berries! It quickly drops down and even swivels! Presto, you’re looking snazzy and on your way in a snap. 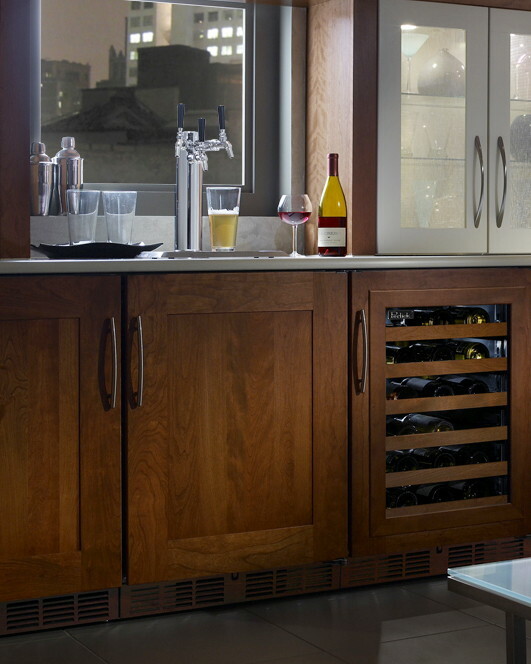 KraftMaid’s Core Guard protects your cabinetry from spills & leaks. Ever had a water leak under your sink? OMG! It can turn costly in a snap. 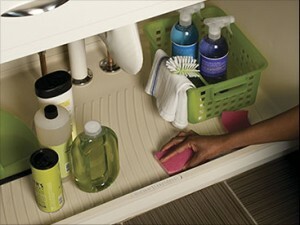 Under sink drip trays are designed to protect the bottom of your cabinet by holding water. 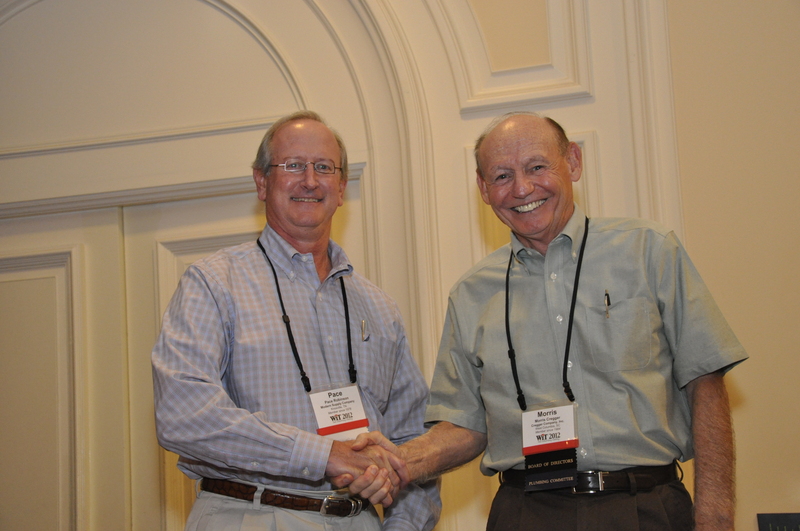 This is an inexpensive way to potentially save big bucks! 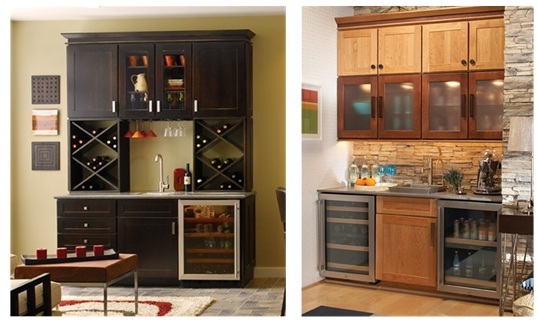 Recycle center from StarMark Cabinets. This entry was posted in Kitchen Trends & Tips and tagged ArmStrong Cabinets, Kitchen pull-out storage, kitchen storage, KraftMaid, modern supply, Modern's Millie, StarMark Cabinets, under sink drip tray on September 17, 2012 by Webmaster. 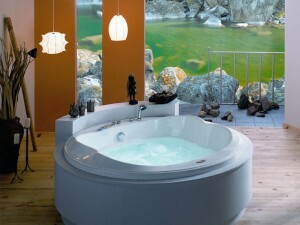 After a long hectic day, nothing soothes my soul like a long, luxurious bath. Ahh…soak away the tension. There’s some super-smart science behind hydrotherapy so here’s some info to help you decide what’s right for you. Hydrotherapy benefits the four important nerve receptors in our bods—contact, temperature, light-touch and pressure. Each sends messages to your brain that stimulate physical reactions. If you’re dreamin’ of a spa tub, you have hydrotherapy options! Heat hydrotherapy opens pores, improves circulation and soothes tired muscles and joints. Oh yeah! Air Bath hydrotherapy stimulates with a fingertip-like massage from head to toe. Whirlpool hydrotherapy is more vigorous and relieves tight and stressed muscles while promoting tissue rejuvenation and joint flexibility. From Jason International’s Designer Collection available with MicroSilk. MicroSilk hydrotherapy rejuvenates, moisturizes and plumps the skin, leaving it silky and younger looking with fewer lines and creases. Billions of oxygen filled micro-bubbles energize cells, kill bacteria and promote feelings of well-being. The ultimate opulence! Oh, and accessories! Gotta’ have those. 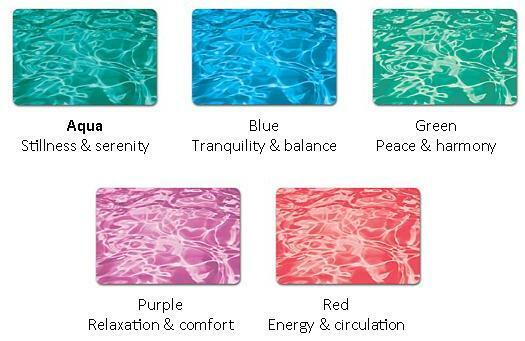 Color impacts your mood so add LED chromatherapy. Turn on the green light and create peace & harmony. There are also units with sound and aromatheraphy. I’m more tranquil just talkin’ about it! 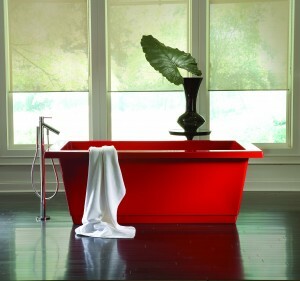 Square, corner, oval, rectangular, free-standing or built-in, Modern Supply has a spa tub to suit everyone. Stop by—we’d be tickled to help you find the perfect fit! Oh yeah….tell ‘em Millie sent you! Follow me on Facebook & Twitter for cool ideas! This entry was posted in Bath Trends & Tips and tagged Air Bath hydrotherapy, chromatherapy, Heat hydrotherapy, hydrotherapy, Jason International, MicroSilk hydrotherapy, modern supply, Modern's Millie, Soaking hydrotherapy, Whirlpool hydrotherapy on July 20, 2012 by Webmaster. 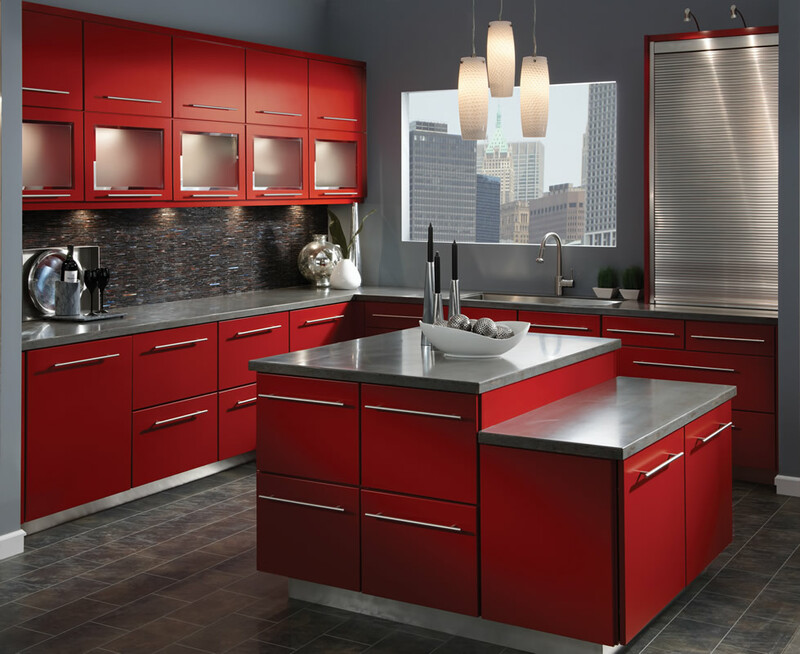 Add pizazz by mixing cabinetry finishes like cherry cabinets with a white island from StarMark. 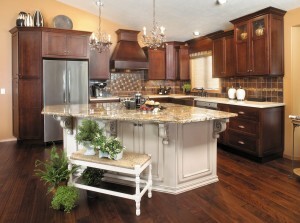 Have you been dreaming about a new kitchen and now you’re ready to take the plunge? Congrats! 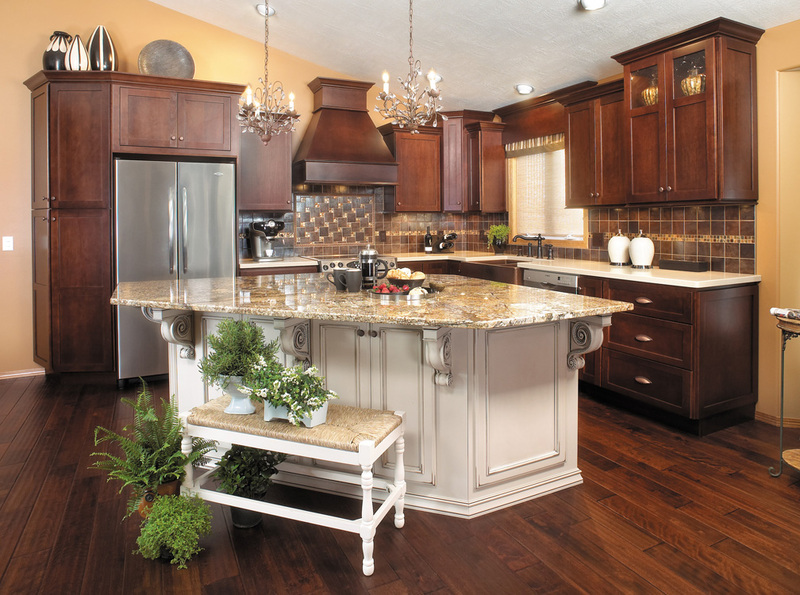 A kitchen remodel is the improvement project that increases your home’s value the most. Where, oh where, do you start? Here are a couple of tips. 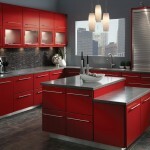 Urban chic maple cabinets in a bold cardinal red from KraftMaid. 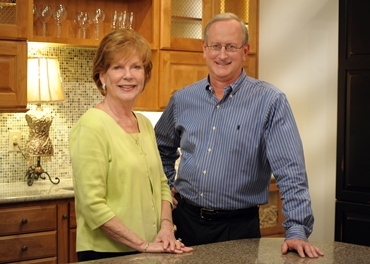 This entry was posted in Kitchen Trends & Tips and tagged kitchen remodel, kitchen remodeling tips, KraftMaid Cabinets, modern supply showroom, Modern's Millie, StarMark Cabinets, Urban chic cabinets on November 14, 2011 by Webmaster.